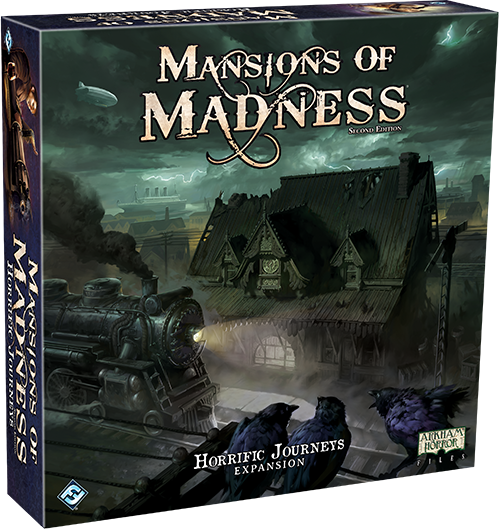 Evil haunts strange, far-flung places in Horrific Journeys, the newest expansion for Mansions of Madness available for Pre order now from Fantasy Flight Games! Reality has begun to deteriorate in the New England countryside, danger rains from the skies, and even the seas are not safe as evil emerges from the depths. In the countryside, a speeding train desperately flees from a threat that defies all laws of reality. In the clouds, a dirigible’s voyage is interrupted by a vicious murder as a storm rolls in. 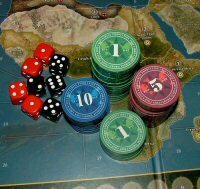 And on the waves, a luxury ocean liner has been sabotaged by some madman planting explosives to sink the vessel. In this latest expansion for Mansions of Madness, the investigators of Arkham find themselves far from the comforts of home, and the danger increases with each step they take away from their beloved city. To stand against the coming darkness, Horrific Journeys calls upon four new investigators from a wide variety of backgrounds, including a sailor, a spy, a musician, and a waitress. These brave men and women are each more than meets the eye, and the unique backstory on the back of their investigator cards tells you what has led them to this point—how they went from living the life of an average citizen to being thrust into the world of Elder Gods and monsters beyond comprehension. To help them fight against and survive the mythos, each investigator has a special ability gained from their personal travels and years of living in a sleepy town on the edge of madness. The sailor Silas Marsh may not have much experience with the supernatural, but he is willing to push himself further than anyone to aid his allies, flipping his horror cards faceup to reroll his dice during a test. Meanwhile, Trish Scarborough, the skilled spy, finds it easy to succeed while performing a search action. Jim Culver is one of the world’s most talented musicians and he begins each game with his treasured Golden Trumpet. Finally, Agnes Baker is a waitress with dark powers that she is only beginning to understand, starting each investigation with her own signature spell. When you choose to step into the shoes of these investigators and bring them to life, you’re accepting the responsibility of defying maddening monsters with the knowledge that you will never receive thanks or even an acknowledgement that your fight exists. Arkham holds its secrets close. Most of its citizens insist that their sleepy town is the very definition of normal, but those who dare to look closer know that all is not right in Massachusetts. Now, as the evil that rots Arkham from within spreads beyond the city limits, you have little choice but to chase down the darkness and bring it to heel. Wherever evil emerges, the investigators of Arkham will be there to fight back the darkness and protect our world from the terrors that thrive beyond our reality. Should you join them, there is no guarantee that you will survive the journeys that await, and even if you can survive, you will not be unchanged. But the call to take a stand is not one that you can deny. Pack your bags, climb aboard, and steel your nerve for the horrors ahead!